We’re so excited to present to you our first video tutorial of 2017! This is a unique recipe that’s just perfect for the upcoming Valentine’s Day holiday. Hope you get to try this recipe out and if you do – please feel free to share your results on our Facebook page please. Below is the video tutorial on how to bake the cupcakes – we’ll be showing you how to frost them in a few days. Pre-heat oven to 180 ºC or 350 °F. Line a regular sized muffin pan with cupcake liners and set aside. Measure & sift your dry (flour & baking powder) ingredients into a medium bowl and set aside. In a large bowl, measure the margarine & sugar. Beat the eggs in a separate bowl and set aside. Fold in the dry ingredients; starting with half the dry ingredients, fold them into the creamed mixture, then add the remaining half and fold it until well incorporated. Add the milk gradually until the batter is of a preferred consistency, drop texture. Divide the batter into two equal parts and then color one of the batters with the red gel color. Spoon half of each mixture into each of the cupcake liners (one side vanilla, one side red). 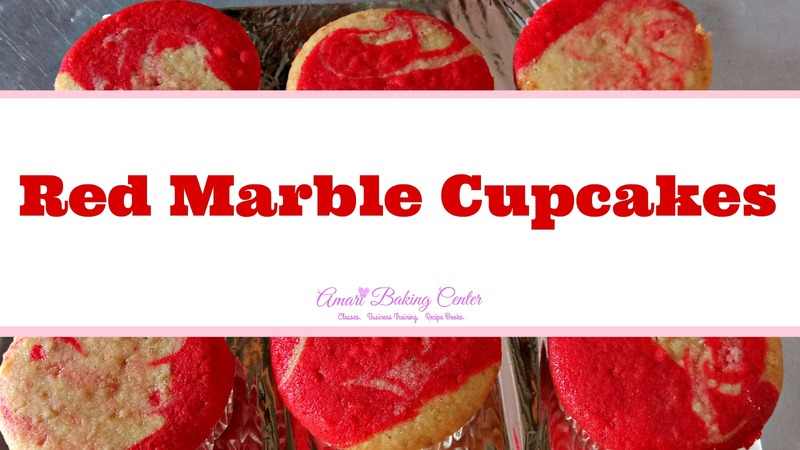 Get a toothpick and swirl each of the cupcake batters to have a marbled effect. We’re having a blog Give-away for those who try out this recipe; you can win awesome prizes when you share your results. For all the details on how to participate and win, click on this link. Deadline to submit your result pictures is Feb. 17th, 9 a.m.